Create Inline Tweet in WordPress Inline To Simply Create Hyperlinks to Share Content on twitter With a Twitter CSS Icon Font With Extra Load. Basically, what you read on our website are what they are implemented on high end Custom Themes. Practically, most of them are available as free software. When we are talking about CSS Icon Font, definitely we can use Base64 Encoding and HTML5 i class to use something which suits our own website’s design. New users will prefer Plugin Way to Create Inline Tweet in WordPress. We do not recommend to use hundreds of Plugins, the complexity increases with increasing number of plugins. Most of the functions actually are of PHP MySQL, either in combination or alone or just some usage of WordPress function. In any case, if you go for the Plugin Way, you can point towards WordPress Plugin Repository and search with the phrase Inline Tweet. 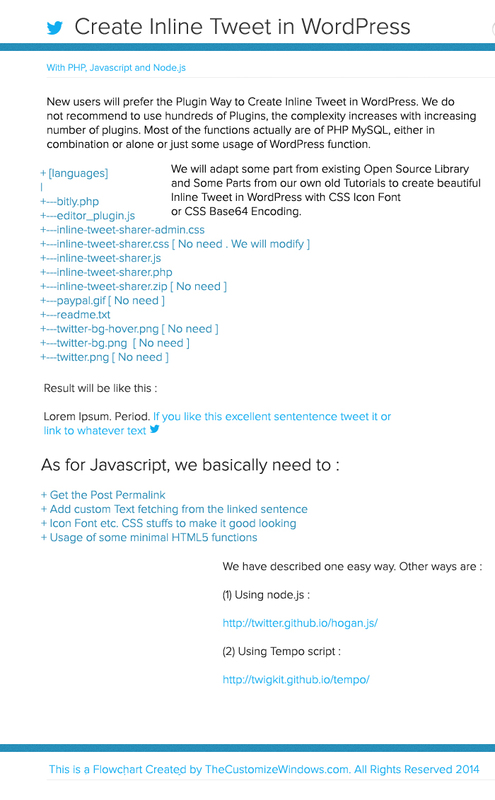 We will adapt some part from existing Open Source Library and Some Parts from our own old Tutorials to create beautiful Inline Tweet in WordPress with CSS Icon Font or CSS Base64 Encoding. i class get rendered when the library loads. We need some stuffs to make universally working. But, we will not load the CSS file for frontend. Because the Twitter Icon-Font or Base64 File is either already in your existing CSS or you can add the lines – actually this is manually combining CSS files. You already know how to add the CSS files for Icon Font. If you do a bit work, actually there will be one PHP file, one Js. This Article Has Been Shared 8162 Times! Cite this article as: Abhishek Ghosh, "Create Inline Tweet in WordPress," in The Customize Windows, April 6, 2014, April 21, 2019, https://thecustomizewindows.com/2014/04/create-inline-tweet-wordpress/.